A geophone is a magnetic device used to measure the Earth’s normal vibrations (some abnormal during events such as earthquakes). These movements are also present when there is a small explosion (commonly used for mining and exploration purposes). The principle of a geophone is similar to dynamo; the movement of the magnet situated inside a coil cause an induced field and the EMF produces a potential difference (voltage) proportional to the movement. Since, the magnet is spring-loaded and moves along with the small vibrations in the earth, measuring the voltage allows you to measure the movements. ProtoCentral’s OpenPressure is a precision analog signal acquisition platform, that is also very easy to use. It is compatible with Arduino and can be programmed using the standard Arduino IDE. 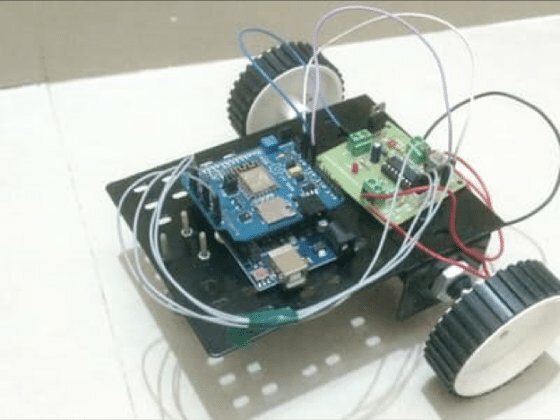 Everything required to drive a sensor, including voltage and current excitation, on-board battery management and a boost DC/DC converter for precision voltage reference make it a highly usable platform for sensing. For this particular sensor however, an excitation source is not required since the sensor itself produces a voltage (like a dynamo). But the voltage produced is so small that is requires amplification and here’s where is the OpenPressure was useful. We used the SM-24 geophone available at Sparkfun as the sensing element. This device is a standard geophone that works similar to the principle described before. The output leads are directly connected to a differential channel on the OpenPressure board’s ADS1220 ADC. Shown below are the connections to be made. The two ends of the geophone are connected to the AIN0 and AIN1 channels, which are differential inputs. In the below picture, you can see wires soldered from the sensor to the board. That’s it, the connections are simple.